DRONES THAT WEIGH above 250 grammes will need to be registered, under proposed new legislation from the European Parliament. The move comes after several recent incidents involving drones and commercial aircraft, which included a near miss for an Aer Lingus flight in Paris and a mid-air collision near Heathrow in London. The updated safety rules will bring all unmanned aircraft, or drones, within the EU civil aviation framework, and specify that all drones weighing above 250 grammes will require registration with a national authority. In a statement, the EU’s Committee for Transport and Tourism called the move an attempt to “provide a uniform level of safety across the EU”. Deirdre Clune, a member of the Transport Committee and Fine Gael MEP for Ireland South, welcomed the move. She added that “falling technology costs” mean that these drones can be bought for “under €50″. 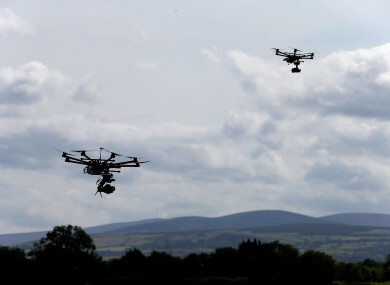 In Ireland’s case, the responsibility for the registration of drones falls under the jurisdiction of the Irish Aviation Authority (IAA). Last year, the IAA introduced measures requiring drones weighing one kilogramme or more to be registered with ASSET, an online terrain mapping system, as well as registering the drone, itself, and the owner’s location details. At the time, the IAA indicated that this policy on drones will be updated to reflect updated EU legislation, and will incorporate any changes. With these new EU proposals, the requirement for registration on drones over 250 grammes will likely come into effect within the next two years. Further information about existing rules and guidelines can be found on the IAA website. Email “Drones will face new rules to cut risks”. Feedback on “Drones will face new rules to cut risks”.